In full transparency, there were tons of fall 2019 trends that won our hearts that you won't see in this roundup, but we can guarantee you that come next season, you'll be served so much fall trend content you won't know what to do with it. Instead, we're here today to give you a sampling of the ones that we feel are the most important—the ones you can memorize and rattle off to all your friends when they ask you what you're looking forward to wearing this fall, to which you can not so humbly reply, "Oh, a hint of pistachio, a punk-romance sort of a dress with a chain choker, and a sleek skirt suit. You know, the essentials." Ahead, follow along as we walk you through the fall 2019 trends that reigned supreme—the ones that are the most important to know right now. But don't worry. As we said before, there's much more where this came from, so stay tuned as we continue to cover forthcoming fall styles all year long. 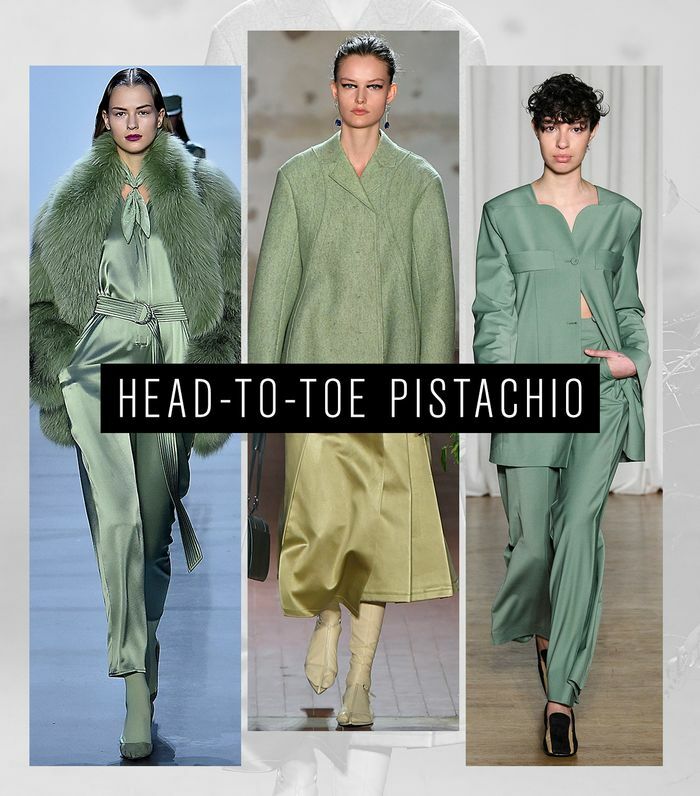 While there were heaps of new color trends—including red and orange as a couple and purple palettes—that made their way down the runways, it was the overwhelming presence of pistachio that caught our eye. Just like the nut, this hue is addicting, so much so that designers clearly couldn't help but style models in head-to-toe pistachio looks. No, that trend name wasn't just for the sake of the rhyme. This season was filled with an air of punk-rock grunge but served on a frilly, romantic platter. The color? Black. The shoes? Combat boots.The accessories? Chains and chokers. The clothing? Some of the prettiest lace dresses we've ever seen. This dynamic duo proves sometimes, opposites really do attract. One of the biggest slam-dunk trends of fall will undoubtedly be the art of layering all of your knits on top of each other. Whether it's a sweater on top of a sweater or a knit bra under a cardigan, the rule of thumb here is simple: the more knitwear, the better. Place all the F/W 19 models upsidedown inside a box, take their shoes off, and it would look like a lifesize version of a crayon box. Yeah, that's how bold the hosiery was that came down the runway. Paired with everything from frilly dresses to skirt suits, the colored tights we saw make a mild splash for spring have reemerged as one of the biggest (and funnest) fall trends to try. Ready to go back in time? In the F/W 19 shows, the clothing proved to be taking inspiration from a period long, long ago. We saw exposed boning on dresses and bustiers, pretty puffy sleeves on ball gowns, capes, and Victorian neck ruffles so high models looked nearly headless. Don't consider yourself a morning person? Then this trend is for you. Quilting was a texture we saw sprinkled quite evenly across the map, as it showed up on everything from evening gowns to trousers. Besides the billowy, plush feel and look of quilting, we saw the theme of patchwork make a name for itself among the trend, making the wearer truly feel like they're still in bed. Appealing, no? Anything that looks like it could almost be a classic piece in your wardrobe but is a little too cool to be considered a true staple is what this trend is all about. Classics with a twist, if you will. This includes updated trench coats, fresh denim styling, and punk-inspired adornments on things like suits and bags. This stunning trend is truly one for the books. Designers went back to the drawing board this season (pun intended) to create looks that incorporate the beauty of all you would find in a museum on the likes of dresses, hats, shoes, and even belts. Here, we highlighted the portrait-gallery wing of the exhibit, but dive deep into the F/W 19 shows, and you'll discover watercolor prints, crafty belts, and screen prints. One of the most festive fall trends is one we haven't seen in quite some time—lamé. This blast-from-the-past fabric is one that shone so bright on the runway and will soon do the same in our closets. Buy into this trend, and you'll be ready to party in no time. Next up, shop the most popular spring colors according to Zara.